Albertsons Companies LLC is an American grocery company founded and headquartered in Boise, Idaho. It is privately owned and operated by investors, including Cerberus Capital Management. With more than 2,200 stores and more than 250,000 employees, the company is the second-largest supermarket chain in North America after Kroger, which has 2,778 stores. Albertsons ranked 53rd in the 2018 Fortune 500 list of the largest United States corporations by total revenue. Prior to its January 2015 merger with Safeway Inc. for $9.2 billion, it had 1,075 supermarkets located in 29 U.S. states under 12 different banners. Its predecessor company, Albertsons, Inc., was reorganized as Albertsons LLC and sold to AB Acquisition LLC (a Cerberus Capital Management-led consortium). After buying back the majority of its former stores it sold to SuperValu in 2006, AB Acquisition announced it would change its name to Albertsons Companies Inc. in 2015. The company's corporate name was Albertson's until 2002, when the apostrophe was removed. Albertsons was founded by Joe Albertson on July 21, 1939 in Boise, Idaho. An ad in the Idaho Statesman newspaper touted Joe Albertson's first store as "Idaho's largest and finest food store." The store was filled with perks that, at the time, were brand new: free parking, a money-back guarantee, and even an ice cream shop. The original store was built onto several times, but it was demolished in 1979 and a replacement store built on the same property. A brick monument stands on the northwest corner of 16th and State Streets in downtown Boise, commemorating the original store. Joe Albertson's grocery store was an enormous success, and he reinvested his profits back into the business. 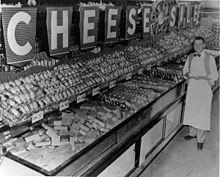 New stores were opened in neighboring towns to the west, Nampa, Caldwell, and Emmett, before Pearl Harbor in late 1941. The company grew steadily in the years following World War II. When Albertson was considering putting a new store in a town, he would drive around the town and look for neighborhoods with lots of children's clothing hanging on clotheslines; he knew that those kinds of neighborhoods were where he wanted to build his stores. Albertsons, Inc. became a public company in 1959, and its growth continued, opening its 100th store in Seattle in 1964. In 1966, Albertsons expanded to southern California by acquiring Greater All American Markets, a small chain in Orange County. In 1969, Albertsons partnered with Skaggs Drug Centers, owned by The Skaggs Companies, Inc., to create the first combination food/drug stores, first in Texas. The partnership was a tremendous success for several years. The partnership ended due to the fact that it was getting more difficult to control. Neither partner could buy each other out, and the partnership was dissolved amicably in 1977. Skaggs kept stores in Texas, Oklahoma, and Arkansas, and Albertsons kept stores in Florida, Alabama, and Louisiana, as well as some Texas stores (based out of San Antonio). Albertsons continued to expand its base in the West during this time, buying Fazio's-Shopping Bag in 1972 from Fisher Foods, adding 46 stores to the Los Angeles area. In 1982, Albertsons reorganized its management into four regions: California, Northwest, Intermountain, and South. The South stores included stores in Texas, Alabama, Louisiana, and Florida, as there were no stores between Louisiana and Florida. Albertsons continued to add stores in the 1980s, building or acquiring about 283 stores during the decade. Albertsons continued to expand in Texas beyond the Skaggs base in north Texas and San Antonio, entering the Dallas-Fort Worth market in 1984, and adding three Skaggs-Alpha Beta stores in Austin within months after entering that market in early 1989 with the acquisition of six Tom Thumb stores. Albertsons began to expand heavily in the 1990s. In 1992, Albertsons bought the stores American Stores (formerly Skaggs Drugs Cos.) had in Texas, Oklahoma, Arkansas, and Florida. Many of the stores had been opened as Skaggs Albertsons originally (later turning into "Skaggs Alpha Beta" under American Stores ownership) but by 1991 had been rebranded as Jewel-Osco. These included a few stores that American Stores opened in the late 1980s under that name in Florida. Additionally, a non-food distributions center in Ponca City, Oklahoma, was purchased from ASC. The Skaggs acquisition was a success, and the new stores were integrated into Albertsons' Southern division. The ease of that acquisition and Albertsons' high-flying stock price led Albertsons to attempt expansion on a grand scale. In a series of acquisitions in the late 1990s, Albertsons purchased Seessel's and 14 other stores from Bruno's, Buttrey Food & Drug (divesting seven Buttrey stores and six Albertsons stores to Smith's and another two Buttrey stores to SuperValu), the Springfield, Missouri Smitty's chain, and three Super One Foods stores from Miner's Inc. in the Des Moines market, all while building new stores across all divisions. These acquisitions brought Albertsons into five new states: Georgia, Iowa, Missouri, North Dakota, and Tennessee. In 1999, Albertsons made its biggest acquisition yet: American Stores Company, which included the chains ACME in Pennsylvania, New Jersey, Maryland, and Delaware; Lucky in California and Nevada; Jewel, Jewel-Osco in Illinois, Indiana, and Iowa, and two drug store chains: Osco Drug and Sav-on Drugs. The acquisition briefly made Albertsons the largest American food and drug operator, with over 2,500 stores (including stand-alone drug stores) in 37 states, until Kroger's acquisition of Fred Meyer closed the following month. To make the acquisition, Albertsons was forced by anti-trust concerns to sell 146 stores, primarily in California, Nevada, and New Mexico. In southern California, there were already Albertsons, so in order to not have two banners in the same area, Lucky stores were converted to the Albertsons banner in November 1999, and the Lucky brand name was retired. In January 2001, Albertsons restructured its "districts" to a divisional structure mostly based around distribution centers, with a drug store division and 18 regional division offices. On July 18, 2001, Larry Johnston, the new chairman and CEO of Albertson's, announced it would close 165 "underperforming" stores spread across 25 states, cut jobs, and reduce its newly created operating divisions. The first change was that the Utah, Idaho, and Big Sky (Montana) division were merged back into Intermountain, while Oregon, Washington, and the Inland Empire (eastern Washington and Northern Idaho) division would be consolidated back into a single Northwestern division. Albertsons sold its freestanding Osco Drug stores in the northeastern states to Jean Coutu Group, a Canadian drug store company (those stores were re-branded as Brooks Pharmacy after the sale was completed in January 2002). In 2001, the short-lived Des Moines stores would close as well and Albertsons began to issue Albertsons Preferred Savings Cards for all of its stores. San Antonio: Having been in San Antonio since the Skaggs Albertsons days, at the time Albertsons was ranked as the area's number two grocer by market share, compared to H-E-B's top position in the market. At the time of the withdrawal, the 44-store H-E-B chain held a commanding 61 percent market share, while Albertsons held a 15 percent market share. Albertsons had held the third position at the time Kroger exited the market in mid-1993 when it closed its 15 area stores. Then, H-E-B's 37 area stores held a 43.2 percent market share, Kroger's 15 area stores a 13.7 percent share, and Albertsons' 10 stores a 13.1 percent share. The remaining stores in the San Antonio division, primarily in the Austin area, became part of the Dallas division. The last store in South Texas to close, a store in Victoria, Texas, was closed in October. Mid-South: In 2002, Albertsons shuttered its Mid-South division by selling its Seessel's supermarket chain in Memphis to Schnucks and stores in Mississippi to Brookshire's. The stores in the Nashville area, most of which were former Bruno's stores, were sold to Publix. Houston: After entering the market in the early 1990s, the troubled Houston division would be gone too, with Albertsons closing its 43 area stores, with most reopening as Kroger or Randalls (acquired with Safeway in 2015 and subsequent return to Houston), with 2 of them becoming H-E-B stores. The Louisiana stores from that division joined the Florida division (though they would move to the Dallas division soon after), while the stores in the Bryan–College Station area became part of the Dallas division. The Greater Houston distribution center near Katy, built in 1996 was sold to 99 Cents Only Stores in 2003. Additionally, the distribution center in Tulsa, Oklahoma (home of the Great Plains division) was sold to Fleming Companies, though no stores were closed. The Great Plains division stretched all the way into Omaha, Nebraska. The sale of the distribution center included a distribution deal for Fleming to continue to supply Oklahoma and Omaha. After stabilizing the company's finances and consolidating divisions, in 2004, Albertsons acquired Shaw's Supermarkets and Star Market from Sainsbury's for $2.5 billion. Albertsons also purchased Bristol Farms for $135 million. During the same time, Albertsons exited the markets of Omaha, Nebraska, where it closed or sold 21 stores, and New Orleans, Louisiana where it closed seven, selling four to A&P, which converted them to Sav-A-Center. Despite this, the acquisition spree had caused significant problems for Albertsons, Inc. Many of the acquired chains had systems that did not mesh well with Albertsons. Financing those acquisitions required Albertsons Inc. to take on significant debt. Added to those problems were significant changes in consumer buying patterns, including new competition from large discounters such as Walmart and Costco that impacted sales. After several assessments of the company and months of rumors it was announced on January 23, 2006, Albertsons, Inc. was to be sold to a consortium of companies. SuperValu would take the bulk of the company including the brand names and what was considered to be the stronger divisions, including the Albertsons divisions of Southern California, Northwest, and Intermountain, as well as the ACME, Shaw's Supermarkets and Star Market, Bristol Farms, and Jewel-Osco brands. CVS would acquire 702 stand-alone Osco and Sav-on Drug stores (closing about 100 of them) and converting them to CVS/pharmacy stores. What was left of Albertsons Inc. became Albertsons, LLC, purchased by a Cerberus-led group of investors, and CVS Pharmacy. The acquisition was completed on June 2, 2006 with the Cerberus-led group (who also included Kimco Realty Corporation, Schottenstein Stores Corp., Lubert-Adler Partners, and Klaff Realty). They held Albertsons LLC as "AB Acquisition LLC". Albertsons LLC included 661 stores and the distribution centers and offices from five of Albertsons divisions. These five divisions were thought to be Albertsons' five weakest divisions, and conventional wisdom in the industry was that the stores would eventually be closed or sold to other operators. CVS acquired all (approximately 702) of the stand-alone Osco Drug and Sav-on Drugs rebranding them all as CVS Pharmacy, though they closed approximately 100 of the acquired stores. Many CVS locations were close to Sav-on stores. CVS also acquired one distribution center. Following the sale, Albertson's, Inc., was removed from the NYSE. Albertsons LLC was technically the successor company to Albertsons according to SEC filings but it was New Albertsons Inc. assumed most of the debt, got most of the property, and transitioned Albertsons stock into SuperValu stock. The five Albertsons Inc. divisions that remained as Albertsons LLC were the Dallas/Fort Worth division (Texas excluding El Paso, Oklahoma, Louisiana, and Arkansas), the Rocky Mountain division (Colorado, Wyoming, Nebraska, and South Dakota), the Southwest division (Arizona, New Mexico and El Paso, Texas), the Florida division (Florida), and the Northern California division (northern California and northern Nevada). Albertson's LLC has concentrated on rebuilding market share and its store base in its strongest areas, and divesting stores and other property in its weaker areas. On June 6, 2006, only one week after Albertsons LLC was created, the company announced its intent to close 100 Albertsons stores by August 2006. Those closures were spread across all five divisions. Soon after, the company announced that it would be shutting down its online delivery service on July 21, 2006. To distinguish the two companies, Albertsons LLC created a second website, AlbertsonsMarket.com. In November 2006, it was announced that the Northern California division, consisting of stores located in northern California and northern Nevada, would be sold to Save Mart, with deal closing in February 2007. The company gradually converted all the stores to its Save Mart banner over summer 2007, except for stores in the San Francisco Bay area, which were rebranded as Lucky. The deal included two NorCal distribution centers. Most of the Albertsons locations had originally been branded as Lucky before Albertson's 1999 purchase of American Stores. Most of the changes in the next six years would downscale the remaining divisions. In the Dallas-Fort Worth division, in 2007, the distribution center was sold to Associated Wholesale Grocers, and Albertsons would exit both Oklahoma and Austin. The Oklahoma stores were sold to Associated Wholesale Grocers associates while the Austin stores were sold to H-E-B. With the closures, only four stores south of the Dallas-Fort Worth area existed in Texas, all of which were closed or sold by December 2011. Additionally, many of the Dallas-Fort Worth stores closed during this time, even into 2011. The Florida division, which was always discontiguous with Albertsons' main market, suffered a blow in June 2008 when Albertsons LLC entered into an agreement with Lakeland, Florida-based Publix stores to sell 49 Florida Albertsons locations to the chain. This included 15 stores in Northern and Northwest Florida, 30 locations in Central Florida, and four locations in South Florida. The sale was completed in September. In April 2012, the company closed most of its stores in Florida. The Plant City distribution center was sold to Gordon Food Service though the Florida Division continued to be located there. By April 2012, only four stores remained in the entire state of Florida. The Rocky Mountain division slowly shed stores. By April 2007, there were only 32 stores left in the state of Colorado. In December 2007, SuperValu acquired the eight remaining Wyoming locations from Albertson's LLC not already owned by the company. These stores continued to operate under the Albertsons banner. 2008 also brought the sale of Albertsons' lone South Dakota and Nebraska stores to Nash Finch. In August 2009, the distribution center and division office closed and the 26 remaining stores moved to the Southwest division. Only the Southwest division was spared the major cuts suffered by the other divisions. On June 12, 2007, Albertson's LLC agreed to acquire all Raley's locations in New Mexico. The acquisition includes one closed and eight operating stores in Albuquerque and one store in Taos, thus doubling Albertsons store base in the Albuquerque region. A typical Albertsons-Savon store in Dallas, Texas in October 2005. This store has since been sold as part of FTC-ordered divestment, and later became Minyard Sun Fresh Market, but has since closed. In June 2007, Albertson's LLC decided to discontinue its Preferred Savings Card Program, choosing instead offer discounted items to all of its customers. In September 2007, all Albertsons stores in the Dallas/Fort Worth, Texas, and Florida markets began collecting their Albertsons Preferred Savings Cards. and in May 2008, Albertsons exited the fuel business and sold 72 Albertsons Express gas stations to Valero Energy, which converted most of them to Corner Store locations. While Albertsons LLC had restored its stores to profitability, SuperValu's New Albertsons Inc. had done poorly. While SuperValu did remodel many stores and open a few new stores, New Albertsons had shrunk. Of the 1100+ stores SuperValu acquired in 2006, less than 900 remained by 2013. Under SuperValu, Bristol Farms had been sold off, 36 Utah stores were sold to Associated Food Stores (leaving just three traditional Albertsons stores in the state), the Wisconsin Jewel-Osco stores had been sold or closed, as well as the Shaw's stores in Connecticut. Additionally, like Albertsons LLC, most of the fuel stations had been shuttered or sold to other operators. On January 10, 2013, it was announced that SuperValu was selling New Albertsons (Albertsons, ACME, Shaw's/Star Market, and Jewel-Osco, though they had previously sold off Bristol Farms in 2010) to Cerberus Capital Management. The deal was closed in March 2013. In February 23, 2013, AB Acquisition announced it would split operations of the newly combined company into eight divisions: Northwestern, Intermountain, Southern California, Southern, Jewel-Osco, ACME, Shaw's, and Southwestern, and in March 2013, the deal was officially closed. On paper, Albertsons LLC controlled the Albertsons-branded stores and New Albertsons Inc. controlled ACME, Shaw's/Star Market, and Jewel-Osco, but it was operated as one company. On June 11, 2013, Albertsons announced its plans to merge its duplicate websites, social media accounts and mobile apps onto one of each kind, ending the use of the Albertsons Market branding (though this was never used on store exteriors) and AlbertsonsMarket.com. While its website consolidation appeared to take place as expected, its applications received bad reviews—but the biggest consequence was the mistaken deletion of their previous Facebook page and loss of over 200,000 fans. While no details were given as to the mistake made, Albertsons simply admitted that while attempting to join their Albertsons page with over 200,000 Likes and their Albertsons Market page with over 80,000 Likes, something went wrong resulting in the loss of thousands of Likes and comments. That same month, Albertsons did away with the Preferred Savings Card in the former SuperValu stores that Albertsons LLC had dispensed with in 2007. The cards briefly continued in Southern California stores before being discontinued in July 2013. On September 9, 2013, the company acquired Lubbock-based supermarket United Supermarkets LLC. On February 4, 2014 the FTC voted 4-0 to approve the deal. The acquisition deal cost Albertsons $385 million and required Albertsons to sell its single stores in the Amarillo, Texas and Wichita Falls, Texas markets. The United Supermarkets family brands include Market Street, Amigos, and United Express. After the deal was finalized, the Albertsons Market brand was revived for Albertsons stores operated by United. The first to be branded as such opened in Alamogordo, New Mexico in January 2015. On February 19, 2014, Safeway began to explore selling itself, and by February 21, 2014, it was in advanced negotiations with Cerberus Capital Management. On March 6, 2014, Cerberus (parent company of Albertsons) announced it would purchase Safeway for $9.4 billion in a deal expected to close in the 4th quarter of the year. On July 25, 2014, Safeway stockholders approved the merger with Albertsons. In December 2014, Albertsons announced that the Haggen Company, a Bellingham, Washington, based grocery chain, was buying 146 Safeway, Albertsons and Vons stores, as required by the antitrust review of the merger. On January 30, 2015, Albertsons officially acquired Safeway Inc. after being cleared by the FTC, thus giving it control of the Safeway store banners, including Randalls, Tom Thumb, Carrs Safeway, Vons, and Pavilions, plus Safeway's 49% share of Casa Ley, a Mexican grocery chain. Following the merger, Albertsons announced the new company would have 14 divisions led by three regional offices. Acme Division: East Region, existing Acme Markets (based in Malvern, PA). Eastern Division: East Region, existing Eastern Division of Safeway (based in Lanham, MD). Includes stores in Maryland and Virginia. Shaw's Division: East Region, existing Shaw's/Star Market (based in West Bridgewater, MA). Jewel-Osco Division: East Region, existing Jewel-Osco (based in Itasca, IL). Portland Division: North Region, existing Safeway Portland division with Albertsons stores from Northwestern in Oregon. Includes the entire state of Oregon except Ontario, plus Clark County, Washington. Denver Division: North Region, existing Safeway Denver division with some Albertsons stores from Intermountain. Includes stores in most of Colorado (except for the Grand Junction stores which are part of Intermountain, and the Durango stores which are part of Southwest), the eastern two-thirds of Wyoming, all of Nebraska and South Dakota, and Farmington, New Mexico. Intermountain Division: North Region, most of the existing Albertsons division with some Safeway stores from the Seattle Division. Includes all stores in North Dakota, most of Idaho except for the northern panhandle (which is part of the Seattle Division), most of Utah except for the far southern portion (which is part of the Southwest Division), northeastern Nevada, the western third of Wyoming, and stores in the Grand Junction, Colorado area. Northern California Division: North Region, existing Safeway division (based in Pleasanton, CA). Includes stores in northern California and northwestern Nevada. Seattle Division: North Region, existing Safeway division with some Albertsons stores from Northwestern. Includes all stores in the state of Washington (except Clark County) and in the northern Idaho Panhandle. Southwest Division: South Region, merged Southwest Safeway and Albertsons divisions (based in Phoenix, AZ). Includes all stores in Arizona, southern Nevada and Utah, most of New Mexico (except for Farmington which is part of the Denver Division and southeastern New Mexico which is part of the United Division), and El Paso, Texas. Southern Division: South Region, existing Albertsons South division (based in Fort Worth, TX) combined with Tom Thumb stores. Includes stores in northeastern Texas, northern Louisiana, and all of Arkansas. Houston Division: South Region, existing Randalls/Tom Thumb division of Safeway, with the inclusion of South's Florida stores and southern Louisiana stores. Tom Thumb moved to Southern Division. Includes stores in Houston and Austin-areas and all Louisiana and Florida stores. Southern California Division: South Region, merged Vons Safeway division (excluding southern Nevada/Las Vegas stores, which became part of the new Southwest Division) with Albertsons division (based in Fullerton, CA). Includes stores in southern California. United Division: South Region, existing United division (based in Lubbock, TX). Includes stores in the Texas Panhandle and western Texas (excluding El Paso, which is part of the Southwest Division), and southeastern New Mexico. After several months of rumors, the combined operation announced it would go public as Albertsons Companies, Inc. (the new name of AB Acquisition LLC). Albertsons attempted to IPO with the ticker ABS on October 14, 2015, planning to raise as much as $1.7 billion, selling 65.3 million shares with a range of $23 - $26 per share. However, the company postponed the listing due to market conditions, particularly after Wal-Mart warned of more challenged sales earlier that day. Albertsons has reportedly postponed the IPO indefinitely, as of October 2015. All during this time, Albertsons continued to expand, purchasing 70 stores owned by the bankrupt Great Atlantic & Pacific Tea Company (operating under the names of The Food Emporium, A&P, A&P Fresh, Superfresh, and Pathmark), which were quickly reopened as ACME stores after two-day store resets. At the time of the Albertsons-Safeway merger, the 18-store Pacific Northwest chain Haggen purchased 146 West Coast Vons, Pavilions, Albertsons, and Safeway locations that had to be sold due to anti-trust concerns, paying $300 million, plus spending $100 million to rebrand the stores. The FTC had hoped this would create a regional competitor for Albertsons. On September 1, 2015, Haggen announced that the company had filed a lawsuit against Albertsons LLC and Albertsons Holdings LLC ("Albertsons") seeking more than $1 billion in damages. The complaint, which was filed that day in United States District Court for the District of Delaware, alleged that following Haggen's December 2014 purchase of 146 Albertsons and Safeway stores, Albertsons engaged in "coordinated and systematic efforts to eliminate competition and Haggen as a viable competitor in over 130 local grocery markets in five states," and "made false representations to both Haggen and the FTC about Albertsons' commitment to a seamless transformation of the stores into viable competitors under the Haggen banner." A week later Haggen filed for Chapter 11 bankruptcy and began the process of closing all but a few dozen 'core' stores in the Pacific Northwest. Albertsons would buy back 33 of the stores being sold at auction. In January 2016, Albertsons settled the lawsuit, agreeing to pay $5.75 million to Haggen, and subsequently reached an agreement to acquire the remaining 29 'core' Haggen stores located in Washington and Oregon for $106 million, the deal being approved on March 29, 2016. As part of the deal, 15 stores would still operate under the Haggen banner, with the rest converted to Albertsons locations. During this time, the Albertsons family experienced further changes. On January 11, 2016, it was announced that the three remaining Albertsons stores in Florida, located in Largo, Altamonte Springs and Oakland Park, would be re-bannered as Safeway; this marks the first time that the Safeway brand would exist on a supermarket operation in Florida. It would also re-align the stores toward the Eastern Division. In 2016, smaller acquisitions included Homedale, Idaho-based Paul's Market and Santa Rosa, California-based G&G Supermarkets. Both brands were closed before they were converted into Albertsons and Safeway stores, respectively. Additionally, the United Supermarkets subsidiary acquired seven locations from Sweetwater, Texas-based Lawrence Brothers. These were converted into United Supermarkets or Albertsons Market stores. In late 2016, it was announced that Andronico's in the San Francisco area would be acquired as well. These stores would become "Safeway Community Markets" and still hold what made Andronico's unique, including chef-prepared items. When the first store reopened in February 2017 under ownership of the Northern California division, it was still bannered as Andronico's due to an issue in obtaining local permits but the other stores were able to reopen as Safeway Community Markets. On February 17, 2017, the Randalls store in south Katy, Texas, serving the Cinco Ranch area closed. On March 6, 2017, shortly after the Katy Randalls closure, it was announced that the Houston-area distribution center near Cypress, Texas, would be closed and the operations consolidated in the Roanoke, Texas Tom Thumb distribution center in the Dallas–Fort Worth metroplex to supply the Houston and Austin-area stores instead. Also, the Houston Division offices would be folded into the legacy Albertsons' South Division offices in Fort Worth. Additionally, the stores in the Albuquerque, New Mexico, market were realigned toward the United Supermarkets division. On September 20, 2017, Albertsons acquired meal kit company Plated for $200 million. On February 20, 2018, Albertsons announced plans to acquire Rite Aid, subject to shareholder and regulatory approval. In addition to retaining the stand-alone Rite Aid pharmacies, its Osco and Sav-on pharmacies located in Albertsons' existing stores were expected to be rebranded as Rite Aid pharmacies. On August 8, 2018, Rite Aid announced that the plan had failed to please shareholders and the proposed acquisition would be cancelled. Albertsons once owned several store brands ("private label" brands), often bearing the name of the chain sold under, e.g. "Jewel" brand products in the Jewel and Jewel-Osco locations. Other Albertsons brands over the years have included Good Day, Village Market, A+, Master's Choice, and Janet Lee (named after the executive vice-president's daughter). The drug store brands (used for health and beauty aids, over-the-counter medications, and intimate paper goods) were consolidated under the name "Equaline," rather than the previous name, "Sav-On Osco by Albertsons" brand. Albertsons introduced an upscale private label brand, "Essensia," in 2003, which was later renamed by SuperValu as Culinary Circle. Store brand items in Albertsons stores included Albertsons (national brand quality food), Shoppers Value (value priced items), Homelife (national brand quality non-foods), Culinary Circle ("gourmet" foods and ready-made meals), Whole Care Pet (pet foods and supplies), Baby Basics (diapers and infant care items), Java Delight (coffee), Farm Fresh (fresh produce), Arctic Shores (frozen seafood), Stockman & Dakota (high-quality beef), Flavorite (national brand quality foods, used throughout Supervalu stores), Stone Ridge (ice cream and sherbet), Super Chill (soft drinks and mixers), Equaline (health and beauty products), and Wild Harvest (natural and organic foods). In 2011 SuperValu announced it would eliminate Flavorite and all brands named after the chains it operates (such as Albertsons, Jewel, Shaw's, etc.) and would replace those labels with a new label, Essential Everyday. After its purchase of Safeway, Albertsons began replacing some of its brands with Safeway's. O Organics and Open Nature replaced Wild Harvest, Pantry Essentials replaced Shoppers Value while Refreshe replaced Super Chill. By late 2015, the remaining store brands were be replaced with "Signature" (formerly Safeway Kitchens, Home, Farms and Care). In addition, Albertsons also started selling Lucerne dairy products, Mom To Mom baby products and Priority Pet Food as well. Albertsons Companies line of Own Brands products launches 1,100 brand new items a year, making it one of the most diverse in-house brands in the country. Albertsons Companies’ O Organics line is one of the nation's largest brand of USDA-certified organic products, with annual sales over $1 billion. The O Organics line offers a wide array of different products, giving every customer on every budget access to healthy, organic items. On average, stores in the Albertsons Companies range between 50,000 square feet (4,600 m2) and 70,000 square feet (6,500 m2) and almost universally feature a produce department, a meat and seafood counter, a deli, and a bakery, with many of the stores also featuring in-store banks and pharmacies. Larger and newer stores may include enhanced amenities, including Starbucks coffee counters, prepared foods, in-store pizza, salad bars, and juice bars. ^ a b c "Albertsons: Albertsons Files Registration Statement for Proposed Initial Public Offering". Albertsons. Retrieved January 5, 2016. ^ a b "Albertsons: About Us". Albertsons. Retrieved January 5, 2016. ^ a b c d Maria Armental (July 25, 2014). "Safeway Shareholders Approve Albertsons Merger". The Wall Street Journal. Retrieved August 1, 2014. ^ a b "Albertsons Companies Inc". Nasdaq.com. Archived from the original on March 8, 2018. Retrieved March 8, 2018. ^ Solomon, Brian (March 6, 2014). "Cerberus Buys Safeway, Merges It With Albertsons For Over $9 Billion". Forbes. Retrieved June 3, 2014. ^ a b Halkias, Maria (January 30, 2015). "It's a done deal: Albertsons and Safeway merger is complete". Dallas Morning News. Archived from the original on January 31, 2015. Retrieved March 13, 2015. ^ a b "Albertsons Companies, Inc". Sec.gov. ^ Albright, Mark (August 6, 2002). "Stores get less possessive". St. Petersburg Times. Retrieved October 16, 2014. ^ "Our History". www.albertsonscompanies.com. Retrieved December 13, 2018. ^ a b c d "History of Albertson's, Inc". Fundinguniverse.com. ^ "The Tennessean from Nashville, Tennessee on June 3, 1998 · Page 35". Newspapers.com. Retrieved May 16, 2018. ^ "The Tennessean from Nashville, Tennessee on August 25, 1998 · Page 37". Newspapers.com. Retrieved May 16, 2018. ^ "FTC Negotiates Settlements in Albertson's/Buttrey Merger to Keep Supermarket Prices Competitive in Montana and Wyoming". Ftc.gov. September 22, 1998. ^ "ALBERTSON'S SWITCHING TO DIVISIONAL STRUCTURE". supermarketnews.com. January 22, 2001. ^ "Albertson's plans to sell 80 New England drugstores". deseretnews.com. December 7, 2001. ^ "Albertson's plans to close all 3 metro-area groceries" Des Moines Register – Des Moines, Iowa Subjects: Business closings Author: Bergstrom, Kathy Date: October 3, 2001 Start Page: D.1 Section: BUSINESS Abstract (Document Summary) The Des Moines area stores closing are at 100 Army Post Road and 3400 E. 33rd St. and in Urbandale at 3799 86th St. Albertson's said it would seek a buyer for the locations of the stores, the firm's only supermarkets in Iowa. ^ a b Milligan, Tara (March 13, 2002). "Albertson's saying good-bye to Memphis; closing, selling Seessel's stores". Memphis Business Journal. Retrieved June 12, 2016. ^ "Publix: Grocer's buying spree not over in Middle Tennessee". Bizjournals.com. Retrieved May 16, 2018. ^ "99 Cents Only Stores Open in Texas – Progressive Grocer". Progressivegrocer.com. ^ "Fleming buys Albertson's facility". tulsaworld.com. ^ "Albertson's, Inc. Introduces Two Stores Under One Roof in Omaha". Prnewswire.com. ^ "Fleming Strikes Major Supply Agreement with Albertson's". Prnewswire.com. ^ Hays, Constance L. (March 27, 2004). "Albertsons Buying Shaw's, New England Grocery Chain". The New York Times. ^ Fixmer, Andy (December 13, 2004). "Albertson's Plans Upscale Push With Bristol Farms Expansion" (PDF). Greif & Co. Los Angeles Business Journal. Archived from the original (PDF) on October 11, 2016. Retrieved June 12, 2016. ^ "ALBERTSON'S TO EXIT OMAHA, SHEDDING 21 STORES". mobile.nytimes.com. ^ "ALBERTSONS TO CLOSE ALL OF ITS STORES IN NEW ORLEANS". The New York Times. April 17, 2004. ^ "News Release dated January 23, 2006". Sec.gov. ^ "Traditions & History". Albertsons. Retrieved October 4, 2014. ^ "Markit RED Notification: Albertson's Inc" (PDF). markit. June 12, 2008. ^ Albertsons to close 100 of its stores Deseret News (Salt Lake City), June 8, 2006. ^ "Lucky return: Save Mart gambles on revival of storied name". Mercury News. July 18, 2007. ^ "Albertson's LLC to Exit Oklahoma, Outsource DFW Grocery Distribution". Progressivegrocer.com. ^ "Albertsons leaving Oklahoma". Tulsaworld.com. ^ "Albertsons to close 5 stores in Dallas-Fort Worth". Dallas News. January 14, 2011. ^ KENNEDY, KYLE (April 11, 2012). "Albertsons Closing Most Florida Stores, Plant City Distribution Center". The Ledger. ^ Pedicini, Sandra (April 10, 2012). "Most Florida Albertsons will shutter". Orlando Sentinel. ^ "Albertsons sells distribution center". Tbo.com. January 9, 2010. ^ "Albertsons closing most Florida stores". Articles.orlandosentinel.com. ^ Albertsons closing 5 Denver-area stores, Denver Business Journal, August 25, 2009. ^ "Albertsons to close more Denver-area stores". 9News. January 8, 2010. Archived from the original on April 16, 2015. ^ "Albertsons closing 9 stores in state". Denverpost.com. January 19, 2007. ^ Supervalu will acquire Albertsons stores, The Casper Star Tribune, December 20, 2007. ^ "Nash Finch to buy Rapid City Albertsons". Rapidcityjournal.com. ^ "Albertsons to shut 5 Colorado stores". Denver Post. August 25, 2009. ^ Albertson's LLC to Acquire Raley's New Mexico Stores, PR Newswire, June 13, 2007. ^ Albertsons to discontinue loyalty cards today, The Arizona Republic, June 20, 2007. ^ "Valero to Buy Albertson's C-Stores". Cspdailynewsd.com. ^ "Supervalu sells 877 stores, reuniting Albertsons under one operator". Drugstorenews.com. ^ Huffstutter, P. J. (October 29, 2010). "Bristol Farms markets sold". Articles.latimes.com. ^ Hancock, Laura (July 29, 2009). "Associated Foods to buy 36 Albertsons stores in Utah". Deseretnews.com. ^ "Albertsons stores in Utah". Albertsons. Archived from the original on March 20, 2017. Retrieved March 25, 2017. ^ "Jewel-Osco store closures to begin March 23". Bizjournals.com. Retrieved May 16, 2018. ^ "SUPERVALU Announces Sale of Connecticut Shaw’s Stores". Businesswire.com. ^ "Supervalu sells most of its gas stations". Bizjournals.com. Retrieved May 16, 2018. ^ "SUPERVALU Announces Definitive Agreement for Sale of Five Retail Grocery Banners to Cerberus-Led Investor Group". Supervalu. January 9, 2013. Retrieved January 14, 2013. ^ "Big Changes are Coming!". Albertsons. Archived from the original on June 29, 2013. Retrieved June 26, 2013. ^ "AlbertsonsMkt for iPhone, iPod touch, and iPad on the iTunes App Store". Retrieved June 26, 2013. ^ "Albertsons Card Free Savings". Albertsons. June 2013. Archived from the original on August 29, 2013. Retrieved March 7, 2014. ^ "Albertsons » Albertson's LLC to Acquire United Supermarkets LLC". www.albertsons.com. Retrieved December 13, 2018. ^ "Albertson's LLC to Acquire United Supermarkets LLC". Albertson's LLC. September 9, 2013. Archived from the original on December 1, 2013. Retrieved February 13, 2014. ^ "Serving Texans in the Texas tradition". United Texas, LLC. Retrieved February 13, 2014. ^ "Cerberus in advanced talks to buy Safeway". Reuters. February 21, 2014. Retrieved February 21, 2014. ^ "Albertsons Owner to Buy Safeway for More than $9 Billion". NBC News. March 6, 2014. ^ "Washington-based Haggen grocery chain buying 146 Albertson, Safeway stores in the West". Fox Business Network. December 20, 2014. Archived from the original on March 26, 2015. Retrieved March 13, 2015. ^ "Safeway earnings may drop / Grocery chain blames slow sales, health costs". San Francisco Chronicle. November 9, 2002. ^ "Albertsons and Safeway Name Senior Leadership Team for Appointment Upon Completion of Proposed Merger". Albertsons LLC. September 19, 2014. ^ "ACME, Stop & Shop reduce A&P purchases". Producenews.com. ^ "ACME: Getting Better Every Day!". Acme. Archived from the original on September 23, 2017. Retrieved December 18, 2018. ^ a b "Judge approves sale of Haggen to Albertsons". The Seattle Times. March 29, 2016. Retrieved April 3, 2016. ^ González, Ángel (September 1, 2015). "Haggen sues Albertsons for $1 billion over big grocery deal". The Seattle Times. Retrieved September 16, 2015. ^ "Haggen Sues Albertsons for Damages" (Press release). Haggen. September 1, 2015. Archived from the original on September 7, 2015. Retrieved September 10, 2015. ^ González, Ángel (September 9, 2015). "Struggling Haggen files for bankruptcy protection, parts with Southwest co-CEO". The Seattle Times. Retrieved September 10, 2015. ^ "Chapter 11 Petition" (PDF). PacerMonitor. September 8, 2015. Retrieved November 16, 2015. ^ Gallagher, Dave (March 9, 2016). "How would Albertsons swallow up Haggen?". The Bellingham Herald. Retrieved January 17, 2017. ^ "Safeway store coming to Altamonte Springs". Orlando Business Journal. January 11, 2016. Retrieved January 23, 2016. ^ "2 Safeway Community Markets, formerly Andronico's, now open in North Berkeley". Berkelyside.com. March 1, 2017. ^ "Albertsons combining 2 Texas divisions". Supermarketnews.com. March 9, 2017. ^ "Presence News" (PDF). Archive.is. March 10, 2017. Archived from the original (PDF) on March 10, 2017. ^ "Albertsons Companies Acquires Plated to Transform the Food Experience for Consumers". Albertsons.com. September 20, 2017. ^ "Albertsons Companies and Rite Aid Merge to Create Food, Health, and Wellness Leader". BusinessWire. Retrieved February 20, 2018. ^ Hirsch, Lauren (August 8, 2018). "Rite Aid and Albertsons agree to terminate their merger". CNBC. Retrieved August 9, 2018. ^ "About Us". Albertsons. Retrieved August 1, 2016. ^ "Three area SuperFresh stores become ACME markets this week". Mainline Media News. Retrieved January 5, 2016. ^ a b "Randalls closes Houston operations, adding staff to Albertsons facilities in Roanoke, Fort Worth". Dallasnews.com. March 8, 2017. ^ "Our Business". www.albertsonscompanies.com. Retrieved December 13, 2018. ^ MULADY, KATHY (January 25, 2002). "Retail Notebook: 'Walk-to' grocery closing next week". Seattle Post-Intelligencer. Wikimedia Commons has media related to Albertsons.